In Retail, Susan Dobson creates images of nothings and nowheres that are apologues for somethings that are happening everywhere: the persistence of memory in social media. On the surface, Retail is an investigation of banal box stores and fast food joints, the standard suburban emporium of commerce and questionable diets: Harvey’s, Chuck E. Cheese, The Beer Store, Home Depot, Sears. 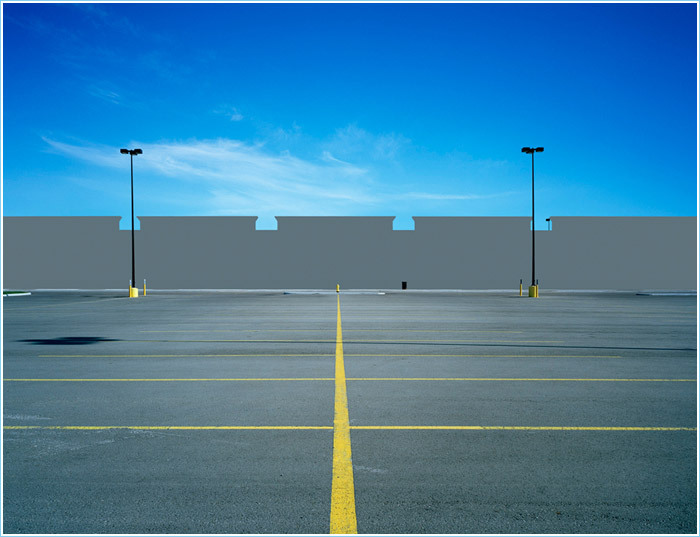 Ostensibly, the images are photographed in the middle of the day, but the parking lots are impossibly empty: no cars, no discarded soda cups, no tangles of shopping carts shoved inside each other. Dobson’s vast foreground surrenders no ground. Yellow parking lines form rectangles of asphalt nothingness. It is difficult, if not impossible, to orient yourself in this space. The perspective is alienating, too high to be from a car, and too low to be on foot. In a few images an errant light pole disrupts the journey from foreground to mid-ground to background, but mostly there is just empty, fast, space. An emptiness that hurls the viewer through the image and smacks us squarely into the store’s facade. But when we get there, there is nothing to see. Dobson has redacted the building’s facade. No more window shopping, in fact, no more windows. No front doors, no SALE signs, no cartoon mouse hocking pizza. No burger and fry combos, hot tuna subs, cold six packs, or open bins of nails. Nothing but blank, gray, nothingness. There is no joy in consumer-ville because Dobson has blotted it out.